Being able to spot price momentum is a great skill regardless of your trading style. Equipped with this ability, you will be able to stay on the right side of the market. There are many ways to judge momentum. You can use the momentum indicator. Or you can watch price action carefully. After all, momentum, by definition, is apparent on the chart. But with the many methods to judge momentum, it’s easy to get confused. Hence, in practice, you will find it useful to stick to a clear way to judge momentum. 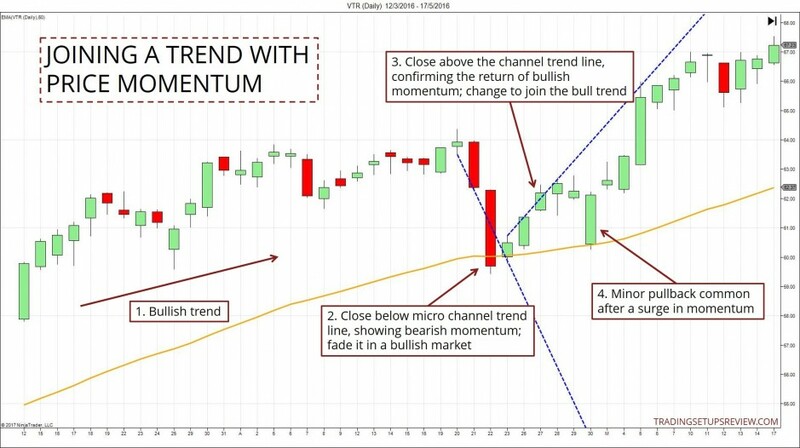 Here, you will learn how to use micro channel trend lines to track short-term market momentum. Let’s build on basic price action trading concepts to explain our tool – micro channel trend lines. The purpose of a trend line is to track a trend. Hence, a trend line is drawn below the price bars in a rising market or above the price bars in a falling market. 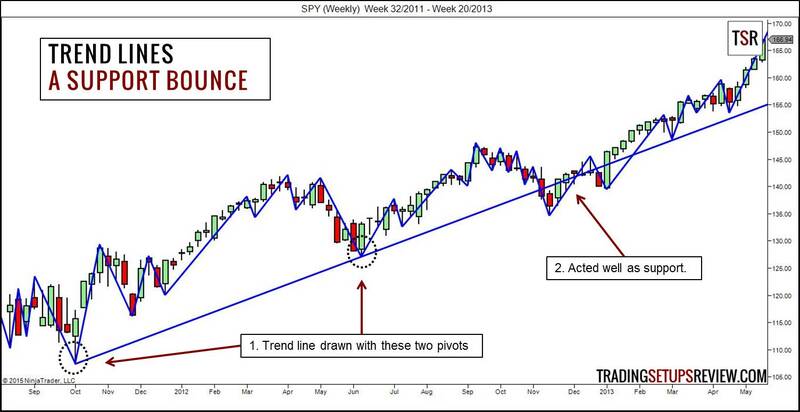 In the context of a bull trend, a trend line often acts as a support for the market. What are channel trend lines? Channel trend lines are drawn to highlight the advance of a trend. 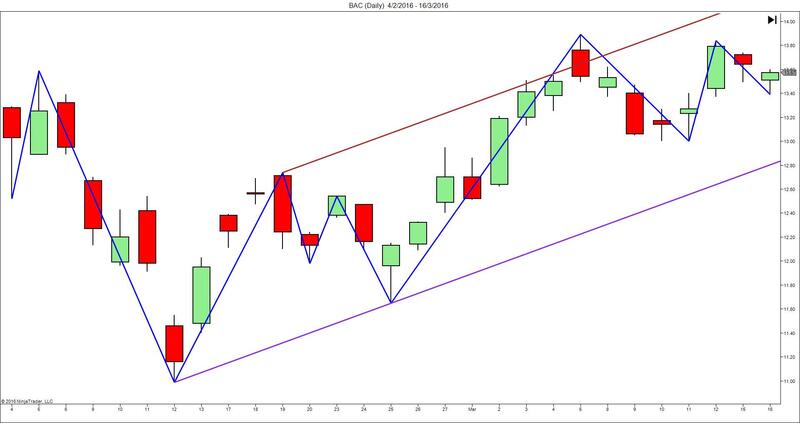 Hence, channel trend lines are drawn above a rising market and below a falling market. You can draw them as parallel lines of trend lines or just by connecting the trend extremes. The brown line in the chart below is a channel trend line. 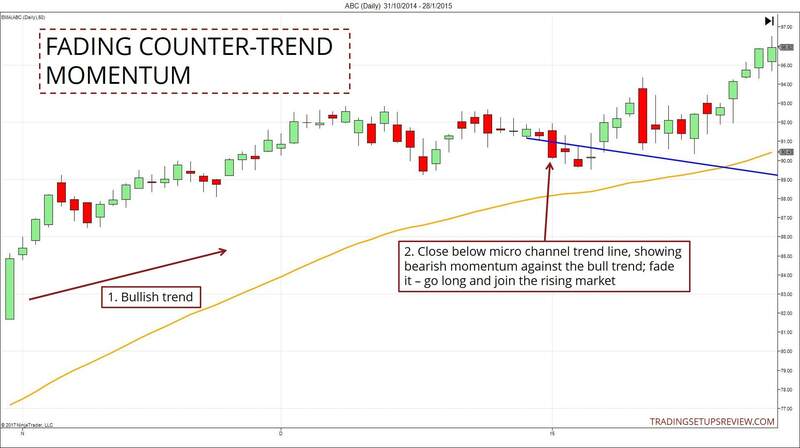 What are micro channel trend lines? “Micro channel trend lines” is a mouthful. Just bear with it, and once you are confident of how to draw them, you can call them whatever you want. Micro channel trend lines are drawn using just two price bars. And you can draw them in both rising and falling markets. Let’s focus on the bullish instance here. Find two consecutive price bars. Ensure that the second price bar has a higher high than the first. Draw a line by connecting the two bar highs. Project the line to the right of the chart. To interpret the momentum using the line, look at its interaction with the third bar. The chart below shows three scenarios you will encounter. For bearish momentum, you need to draw bearish micro channel trend lines. Simply connect two consecutive bar lows to form a downwards sloping line. You’ll find instances of bearish momentum in the next section. Once you can assess price momentum with a simple channel trend line, you are ready to move on to the next stage. Being able to track price momentum is an invaluable skill. But you must combine it with your market assessment to form a viable trading strategy. Each time you spot price momentum, you have the option of flowing into the market with it or fading it. Your decision depends on your evaluation of the market context. Do you expect the market to resume its trend? Do you expect the market to stay in the trading range? Or do you expect it to break out of the trading range? Your answers to these questions will determine how you can make use of momentum in your trading plan. Momentum against the trend does not last. Often, it shows the last-ditch effort of the counter-trend traders in the current pullback. Once you understand this, fading the momentum becomes an excellent way to enter a trend. 1. The market was far above the 50-period EMA and showed a strong bullish bias. We expected the bull trend to continue. 2. This was the first and only confirmed bearish momentum in this pullback. Buying as this bar closed below the micro channel trend line was a good idea. However, when you enter a trade by fading a price move, it’s hard to employ a pattern stop-loss. In such cases, volatility stop-losses are useful. 1. This example shows the market above the 50-period EMA. The momentum signals were interpreted within a bullish context. 2. This bar closed below the micro channel trend line, implying bearish momentum. You could have faded this bar to join the bull trend. This was the trading premise in Example 1. 3. If you had waited for more price action to unfold, you would find another reason to take on a bullish position. This bar confirmed that bullish momentum had taken over. It offered another chance to go long. 4. During a deep pullback in a bull trend, a surge of bullish momentum is a reliable long setup signal. However, it’s common for the market to go against you for a couple of bars as the momentum consolidates. If the market stalls for a longer period, consider an early exit. This method is simple and does not require any complex indicator. As long as your charting platform allows you to draw trend lines, you can implement this approach. In fact, with some practice, you can visualize these micro lines without drawing them. This elegant method helps you spot price momentum while staying close to price action. Instead of using a separate indicator to analyze momentum, let price action set the stage for you. Note that this method focuses on price momentum over the shortest horizon. In essence, we are analyzing the momentum over three price bars. We set up the stage with the first two bars and seek confirmation with the third. The concept of this micro line method is similar to the Anti-Climax pattern in my trading course. Both exploit explosive price movement that is not sustainable against an established trend. Fire up your charts now. Try reading the market by visualizing micro channel trend lines, and uncover another layer of price action information. Very good information. Is it possible to code above strategy in AFL? Glad you like it! I’m not familiar with AFL but it’s a pretty simple concept so it’s very likely that AFL has the ability to code it. Hi Julius, this method is suitable for most time frames as it is a short-term projection of price momentum. The best way to use it, on any time frame, is to find the strongest trend and fade the momentum going against it.